One of my goals is to see how many items I can recycle. While enjoying food or beverages away from home I often check the bottoms of plastic cups and containers for their recycling symbol. If it falls within the guidelines set by my community I will transport those items back home to be added to our recycling bin. I also like to utilize recycled furnishings. Inside my home you will find furniture constructed from reclaimed barn wood, old cabinets purchased from flea markets and antiques stores as well as old pieces of pottery and items I call collectibles. 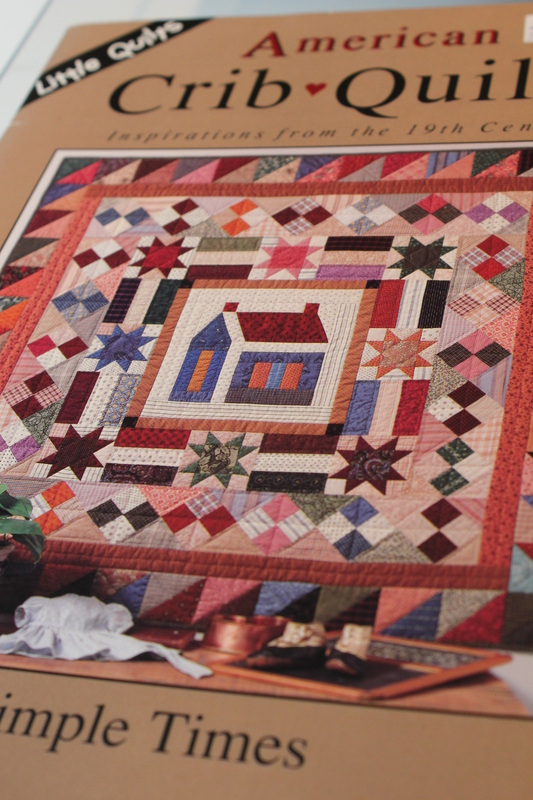 Quilters are often characterized as savers or recyclers. Every time an item is made there are always leftover pieces of fabric. Those remnants or scraps are often accumulated in baskets or tubs for future use. The size of the piece will determine if the scrap is salvageable or not. For some there is no piece too small and yet for others there is a minimum standard set for retention. I have my limits. Anything less than 1 1/2″ x 1 1/2″ is to too small for my liking. 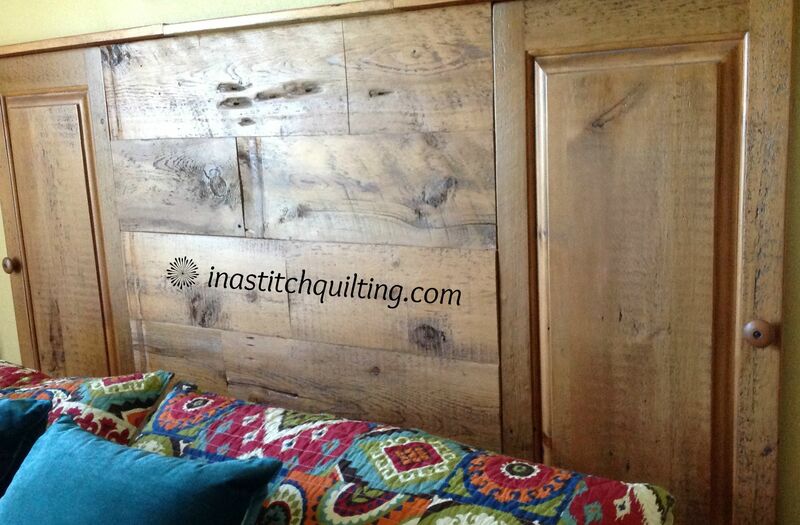 I’ve been sharing my journey to re-purpose or recycle a quilt top, formerly known as the Simple Times Crib Quilt. 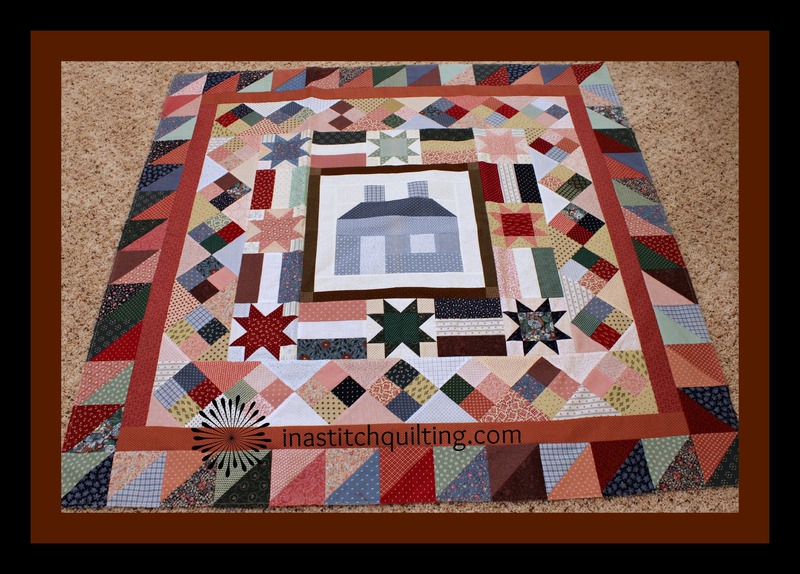 After disassembling its various segments I utilized a portion of the sections to make a mini quilt I call The Blue House. You may read about the adventure here. The Blue House used only a small fraction of the available units. The remaining pieces have been reconfigured into at least five other items. The first is a tiny little critter slightly larger than a standard size sheet of office paper. The body of this small but useful item was taken from a section of the second border. To frame the segment I added a border cut from a sage green fabric. On my conventional sewing machine I quilted it with a very simple straight line stitch. 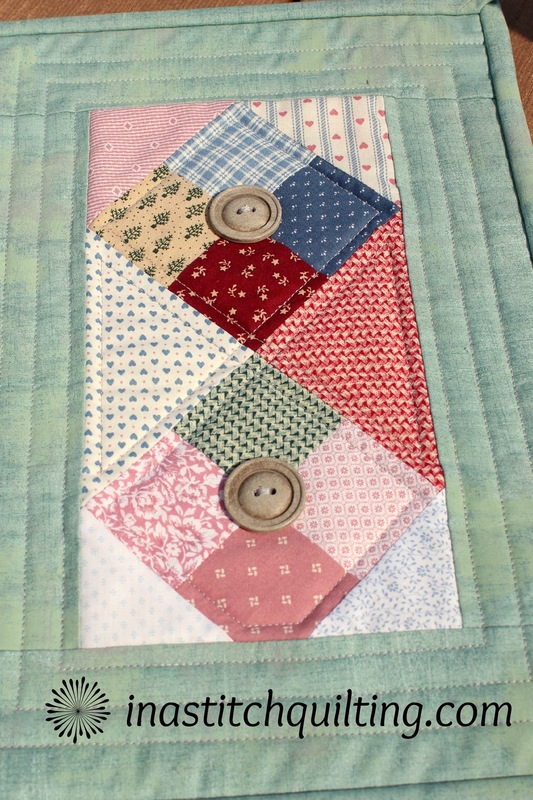 After binding it with matching fabric I added a few buttons for interest. The finished teeny tiny quilt adds a bit of flair to one of my cabinets. I have named it All That’s Left. The second one, which I have labeled Four Square measures 19″ x 29″. The resource for this one was five of the Four Square blocks, also from the second border. As with the first item, I added a border of sage green fabric. 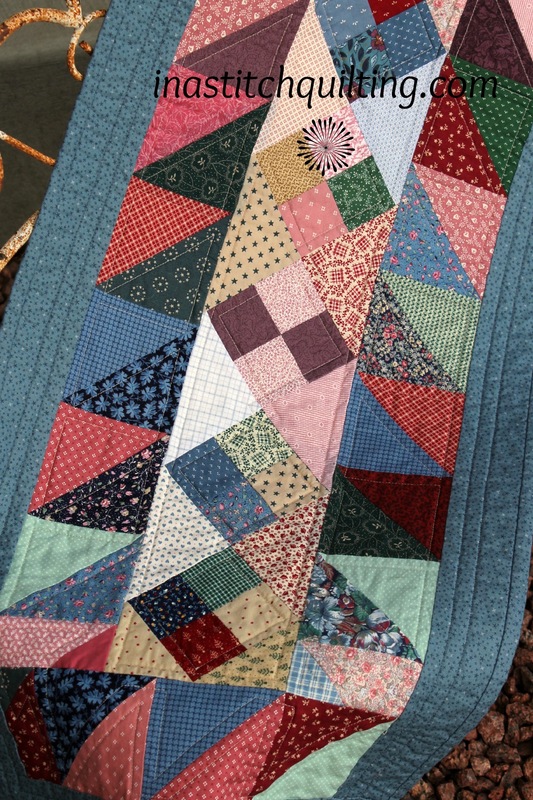 A straight line quilting stitch was used. 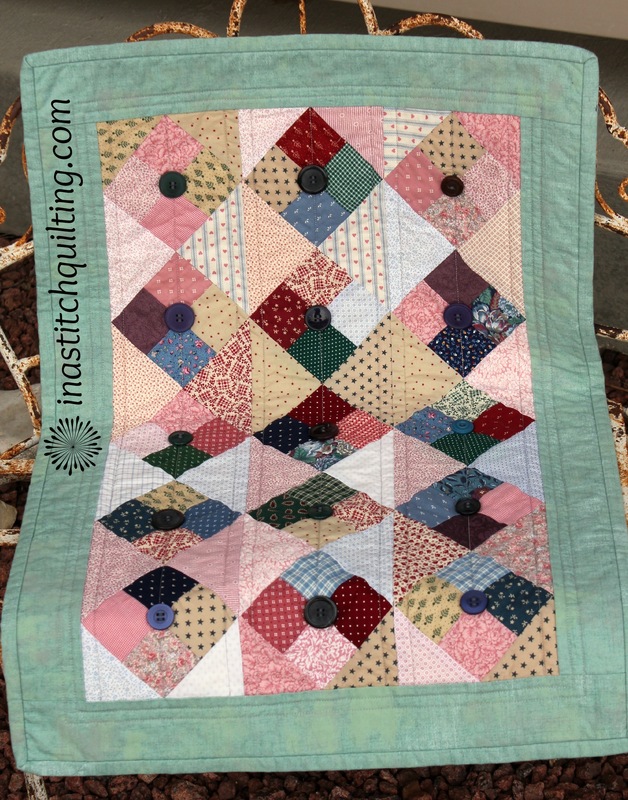 Not to be outdone by the first mini quilt this one sports buttons as well. The quilt currently resides in my office on top of my multi-drawer storage cabinet. I purchased the cabinet from one of my favorite antiques store. Next is the table topper I have labeled Remnants of the Past. This one measures 16 1/4″ x 44 3/4″. As with the other items this too came from part of the second border in the Simple Times Crib Quilt along with the addition of half-square triangles from the original outer-most border. Surrounding the row of half-square triangles is a border of blue material. I pulled this fabric from my inventory. 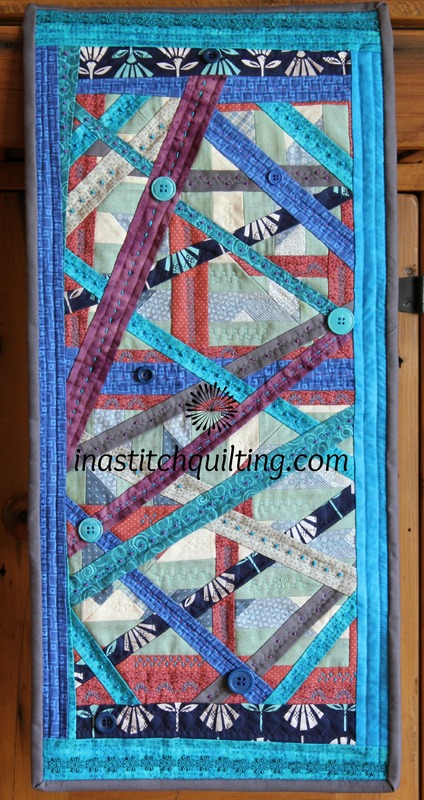 A straight-line quilting stitch was applied with my Pfaff sewing machine. After applying a binding crafted from the same blue fabric I finished it off with a label. As of today the table runner is being used as a decoration on my desk. It makes a very comfortable place to rest my wrists when typing on my keyboard. The remaining two projects have been assembled and carefully pressed. They are patiently waiting for their turn to be quilted on my long-arm quilt machine. Their reveal will not take place until they are finished.